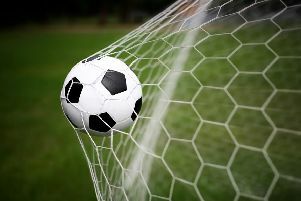 Bexhill United Football Club’s first home league game of the season ended in a narrow defeat this afternoon (Saturday). The Pirates were edged out 1-0 by Mile Oak in a lively Macron Store Southern Combination Football League Division One encounter featuring plenty of chances at both ends. Mile Oak were the better side during the first half and Bexhill were on top during the second period, but it was the Brighton-based visitors who grabbed the only goal in the 49th minute. Wearing their new home strip for the first time, Bexhill were slow to get going and Mile Oak ought to have been at least one goal ahead after the first quarter. Bexhill goalkeeper Dan Rose made a good save with his feet from Michael Gould in the opening three minutes and later repeated the trick to deny Joe Benn when the referee rightly over-ruled the linesman’s offside flag. Rose also pushed aside an angled shot by Lawrence Edwards, while Jack Stenning blasted one attempt just over and fired another effort into the side-netting. Drew Greenall and Nathan Lopez close down the Mile Oak player in possession. Bexhill came into the game a bit more as the first half progressed and threatened really for the first time in the 27th minute when Drew Greenall’s shot from a Craig Ottley corner was cleared off the line by Craig Stevens. Things got a bit feisty towards the end of the half, with Bexhill attacking player Kevin Barden going into the book for a firm challenge which sparked quite a debate between the two sets of players. Benn then flashed a shot right across the face of Bexhill’s goal. A key moment in the contest came right on the stroke of half time. Greenall got on the end of a long ball through the middle of the Mile Oak defence and rounded goalkeeper Aaron Stenning. He appeared to be tripped by away full-back Calum Clarke in the act of shooting, causing him to skew the ball wide, but the referee turned down Bexhill’s penalty appeals. Bexhill began the second period very brightly. Barden’s shot following a good ball from Gordon Cuddington was saved by the feet of Aaron Stenning, who gathered Greenall’s follow-up. The goalkeeper then tipped over Greenall’s deflected header from an Ottley corner. Gordon Cuddington brings the ball under control. Moments later, however, Mile Oak landed the decisive blow. Aaron Steyning claimed a Bexhill corner and launched a superb long kick for Jack Stenning to race on to and fire a first time shot into the far bottom corner. Barden latched on to a good diagonal pass from Ottley and shot wide of the near post as Bexhill responded positively. Cuddington was then desperately unlucky to see his terrific shot at the end of a 40-plus yard run come back off the post. Greenall put the rebound over. It was Mile Oak’s turn to hit the woodwork on the hour as Benn struck the crossbar from six yards following a bit of a scramble. Shortly afterwards the visitors had the ball in the net only to be denied by an offside flag. Greenall received a Ryan Harffey pass, held off his marker well, but pulled his left-foot shot wide of the far post. At the other end, a poor touch by Connor Robertson let in Benn, whose shot was saved by Rose to his left. Chris Rea tussles for possession. Bexhill substitute Corey Wheeler flashed a shot just wide and the home side had a penalty appeal for handball against Stevens turned down. In between times, Jack Stenning’s shot was saved by Rose at the end of a Mile Oak break. In the closing 10 minutes, Greenall again turned well only to mishit his shot and Aaron Stenning made a comfortable save. Jack Stenning’s powerful strike from Benn’s throughball at the other end was well beaten out by Rose. Bexhill: Rose, Rea, Ottley (Butchers 75), McFarlane, Robertson, Harffey, Kidman (Wheeler 53), Lopez, Greenall, Cuddington, Barden (Giles 65).